"Tacos al pastor is a quintessential Mexican dish, with tender pork and pineapple marinated in a savory and aromatic chile sauce. Serve with warm corn tortillas, tomatillos salsa, and lemon or lime wedges." Cook tomato on a ridged grill pan over medium-high heat until slightly blackened, about 5 minutes. Remove from heat and cool until easily handled. Peel off skin and remove seeds. Bring a small pot of water to a boil. Add guajillo and ancho chile peppers; cook until softened, about 5 minutes. Drain. Combine tomato flesh, softened chile peppers, 2 slices pineapple, orange juice, quartered onion, vinegar, chipotle peppers, salt, garlic, cloves, cumin seeds, and oregano in a blender; blend until smooth. Arrange pork slices in a glass or ceramic baking dish. Pour blended mixture over pork, ensuring all sides are evenly coated. Cover baking dish with plastic wrap. Marinate pork in the refrigerator, 4 hours to overnight. Cook remaining pineapple slices on a ridged grill pan over medium-high heat until slightly blackened and soft, about 5 minutes per side. Chop into small pieces. Wipe out grill pan and preheat over medium-high heat. Cook marinated pork in the hot pan, turning once, until browned, 4 to 5 minutes. Chop pork coarsely into small pieces against the grain. Serve with pineapple, chopped onion, and cilantro. 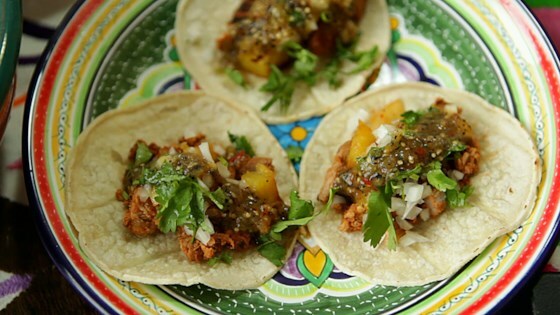 Watch how to make real Mexican tacos al pastor!